Poland is one of the most existing markets in EU. With a population of 38 million, Poland is the largest economy in Central Europe and one of the fasters growing in EU. At the same time, the Polish food and beverage industry is going through a major shift turning to sophisticated wine and culinary options. In 2017, the platform Wina z RPA was launched in Poland, organising tastings, business events and other activities to enhance the position of South African wine on the Polish market. During this opportunity seminar, we will talk about the Polish market and its consumers, as well as looking at upcoming trade events and funding opportunities for 2018. Wina z RPA is hosting an exclusive tasting for Polish Sommelier Association - where we will talk about what South Africa is about today, try wines from warmer and cooler areas as well as get the chance to ask questions directly to the winemakers. Wina z RPA was launched in 2017, as a platform for enhancing the position of South African wine on the Polish market by organising tastings, hosting business meetings, create marketing actions and working for in generall improving the ecosystem for South African wine in the market. On January 19, we are looking at what is planned for 2018, how we can grow together in the market and discussing new ideas and strategies. RSVP to idakymmer@espere.co by January 16. In this seminar, hosted at Wesgro’s offices in Cape Town, we will have a look on characters of and opportunities in the South Korean market, guided by Ida Kymmer, Korea expert and CEO of Espere mixed with recorded interviews with experts from Seoul on the different market segments. Soif d'ailleurs Openwine and Espere - Wine Meetings & New Marketsare connecting winemakers at the Western Cape with wine lovers in Paris in an inter-continental wine tasting. On October 10, the winemakers from Avondale, Kleinood & Reyneke will introduce their wines to an audience at Soif d'ailleurs in Paris directly from Openwine in Cape Town over a live video link. Join us at 8 pm in Paris or Cape Town to embark on a journey across continents. Booking is essential, at respective venue. First South African Wine tasting in Warsaw - October 4, 2017, Hotel Intercontinental, Warsaw. We will ask the question “Why Poland?” - Why should we be interested in this market, right now? The speakers will go through economic and social opportunities for South African wine, looking at the general state of the economy, wine industry and how Polish people enjoy wine and food today. The campaign “Wina z RPA” will be introduced and explained, and we will look at how we, together, can create a stronger and sustainable brand for South African wines in Poland. Ida has a background in journalism and the creative industries, with branding and new markets as focus. She has worked in South Korea, Poland, Bosnia-Herzegovina, Germany, Japan and France. Before starting Espere in 2016, she ran a creative agency in Seoul, and has worked as creative consultant and business development consultant. She has an MA in Peace and Conflict Studies and is half way through an eMBA in Creative Leadership at Berlin School. With Espere, Ida is doing business development and brand building in new markets for her clients, focusing on the South Korean and Polish markets. Ida first came to Poland in 2015, and has since then developed strong ties with the F&B industry. Ida Kymmer will introduce Wina z RPA, the campaign and the planned actions for Poland as well as giving an overview of the current wine industry in Poland. Łukasz is native of Poland and has since his PhD been teaching at Universities in Germany, UK, Spain, France and South Africa. His research topics are network and digital economy, and he is also director for MONSSA, a research institute for digital transformation of Sub-Saharan Africa, looking at how digitalisation is transforming the economy and entrepreneurship in the region. Łukasz will introduce the current state of the Polish economy, how it has been developing and where it might be going. MAŁGOSZATA MINTA, Food journalist, consultant, blogger; book author. Małgoszata writes on food trends and gastronomy for the leading Polish daily newspaper “Gazeta Wyborcza”, www.wyborcza.pl, and the “Kukbuk”, www.kukbuk.com.pl, food & lifestyle magazine. She is a founder and host of the first and biggest food blogosphere conference, Food Blogger Fest, that annually brings together hundreds of bloggers, industry specialists, chefs and marketing & PR specialists. She co-authored of the “Appetite for Poland”, an official publication for the Polish pavilion at Expo 2015 in Milan; and is the author of the book “Dzień dobry Śniadania z Malgosią Mintą”. Małgoszata will, on video directly from Warsaw, introduce wine and food culture in Poland today. As South African wine is relatively unknowing in the South Korean market and often considered as a cheap wine in the New World category, Espere introduces ten high-quality South African wines, not yet on the South Korean market. Apart from the ten different producers, we will have representatives of Graham Beck, Rijks & Spier with us. 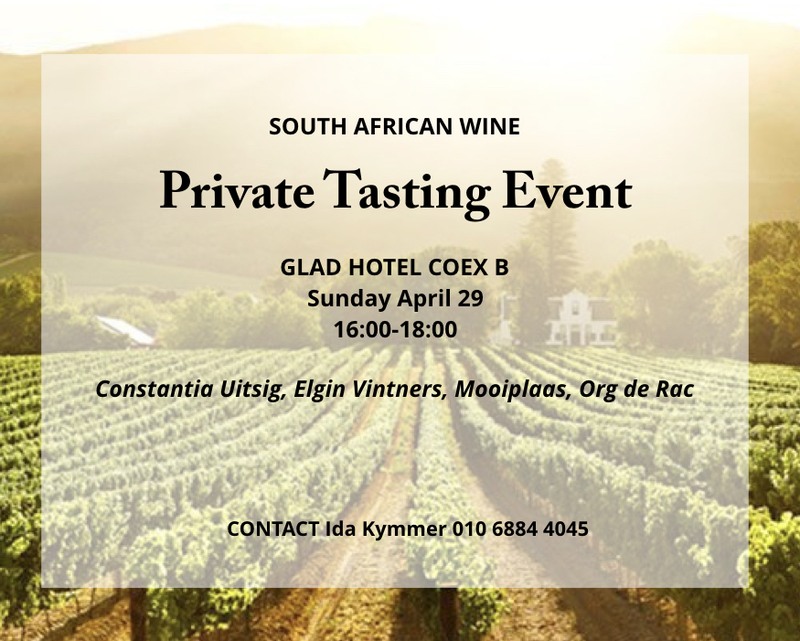 The tasting will start with a general introduction to South African wine as well as a welcome speech by Ambassador Nozuko Gloria Bam.